Some pickups produced by other manufacturers are sometimes mistakenly assumed to have been manufactured by the Rowe Industries Inc./H. N. Rowe & Company/Rowe DeArmond Inc./DeArmond Inc./Tosh Electronics group of companies, all of Toledo, Ohio, USA. Some other pickups have been designed to specifically to give this impression. A selection of the most common examples is shown below. Identifying these pickups in this manner does not infer criticism on them in any way, but merely clarifies their origin. This site would gratefully appreciate any information on this particular subject. This pickup from 1964, shown here with a chrome top, but also available with either a black or white top, installed in some Guild guitars including the X-50 archtop, were not manufactured by DeArmond. It is likely that they were manufactured by the same company that manufactured Guild’s chrome humbuckers, because the above pickup’s connections terminate in a very small insulated connector unit exposed on the underside of the pickup – the same arrangement as on Guild’s humbucker model HB-1 (photos B0550 – copyright ). The three pickups above have been ascribed to Guild/DeArmond, but they are definitely not by DeArmond, as produced in Toledo, Ohio (B0574. Photos copyright The Bonfires Vintage – Kevin). This single-coil pickup with non-adjustable individual pole-pieces is fitted in some Guild Guitars, and is sometimes referred to as the ‘Mickey Mouse’ pickup. 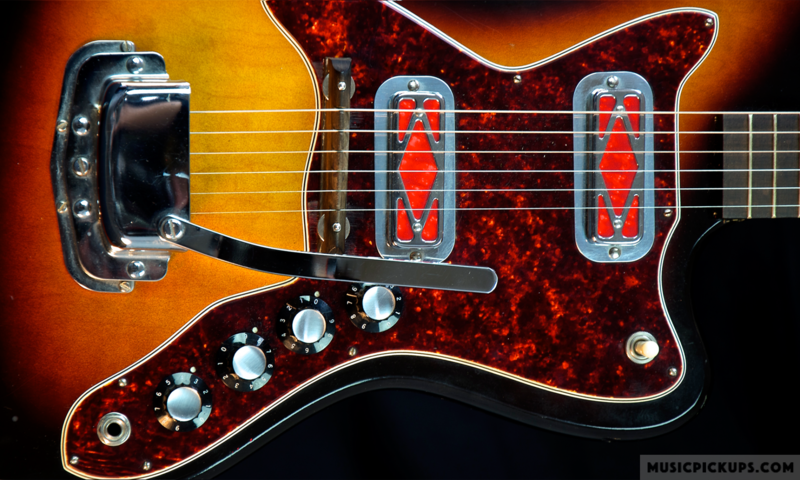 In Guild’s 1969 catalog, it is shown in a T-100D ‘Slim Jim’ guitar and is described as a Frequency-Tested’ pickup. The two photos above show the pickguard from a Magnatone Zephyr guitar. The pickups appear quite similar to DeArmond’s when viewed from the front but when viewed from underneath, it is clear that they are not. This pickup was fitted to a number of Kay guitars. The cover and bezel were manufactured as one pressing. The pickup is quite shallow, enabling it to be surface-mounted on a pickguard or recessed with the bezel hidden. The date of manufacture was sometimes stamped in ink on the underside of the pickup. Note the closeness of the two fixing holes to the pickup body proper. Several cosmetic variations to the plain chrome top exist, including an embossed diamond pattern and a printed black and white pattern. This pickup fitted to a Kay mandolin was manufactured by Kay. The three pickup types above, found on a number of Japanese guitars, may have been manufactured by Teisco. The combination of gold-filled slots and pole openings could lead to mistaken identity as DeArmond items. This Japanese pickup is reminiscent of the DeArmond S-Grille and D-Grille pickups. Two guitar pickups factory-fitted in some Kay guitars are not by DeArmond. Photos 1, 2 & 3 above show Kay’s ‘Speedbump’ guitar pickup. Photo 4 shows a ‘Kleenex Box’ type pickup. Their method of construction is very different to any DeArmond pickup seen to date. The pickup shown above, factory-fitted in a Harmony H55 Sovereign Jumbo acoustic guitar is a version of the Gibson P-13 pickup. The four visible fixing screws help identify the pickup as such (photo copyright Francois Demont). The pickup below shown in a Harmony H655 Sovereign Jumbo acoustic guitar is a version of a DeArmond adjustable pole-pieces pickup, such as Model 55. The two visible fixing screws inline with the pole-pieces help identify the pickup as such (photo copyright Francois Demont). This attachable guitar pickup range shown below, suitable for installation in a flat-top round-hole guitar, branded DeArmond and labelled DeArmond Tone Boss, has recently been produced by Guild. This pickup has no visible rivets and is secured by two screws at opposite ends of the pickup, similar to a Fender Stratocaster pickup. DeArmond’s version does not require a cutout, as it is surface-mounted, being fixed with either woodscrews through hollow rivets, with solid rivets through pickguard material, or fitted in a white or black bezel. This pickup could be fitted neatly into a plastic pickguard. Note the two height adjustment screws which project into the guitar body below and the absence of two rivets between the poles. This pickup has the same frame and fixing arrangement as the D-Grille pickup above. It has has no visible rivets and is secured by two screws at opposite ends of the pickup, as shown. The white plastic bezel differs from the DeArmond version, having the two holes in line with the pole-pieces’ axis. The short ends of the bezel are curved. The original bezel had chamfered edges all round. The DeArmond range of guitars and basses was introduced by Fender in the 1990s. One pickup from that range visually resembles the original Model 2000 (a.k.a. Gretsch Dynasonic Fidela tone ) and is shown below. The above pickup is Fender’s Model 2K. While the upper, normally visible part of the pickup is very similar in appearance to DeArmond’s Model 2000, the underside is very different. ‘DeArmond’ is embossed into one end of this pickup and is visible when installed in an instrument. Fender’s pickup uses one flat bar magnet positioned on each side of the poles, creating a similar magnetic field path to Gibson’s P-90 pickup. This pickup is sold in gold finish with a short neck-fixing arm but without controls box. This pickup is widely available. This pickup and the Repro Model 1000 Rhythm Chief – Version 1 (shown above) would appear to be from the same source.